This will be an exploration in how to set up stock screenings, if you have a lot of experience of playing around with this, please do comment and help me out. A stock screening could have many purposes, most screens are not related to finding the “hidden gems”. The screening could be used to list companies with certain characteristics, for example all Bank stocks in Asia. This post will not be about these type of screens. It will be about screening for stocks you otherwise would struggle to find and stocks that hopefully few others have looked at. Later post will explore other angles of screening, for example dive deeper into what stock characteristics I’m looking for. The beauty of being a Global investor is that you work with the widest possible set of publicly traded companies. I think would be a waste if you as a Global investor did not take advantage of having access to all markets. This should be exploited to the largest extend possible. According to Bloomberg there are 61 000 listed companies in the world. Just like my catch-line of this blog, surely among the 61 000 companies there is bull market somewhere? But with 61 000 companies it is like finding a needle in a haystack, the question is, how do we find the needle? Obviously in practice as a private investor you do not have access to every single market in the world. Few professional investors do either. So in practice, in my case the Global Universe of stocks is listed on one of these countries exchanges: Australia, Austria, Belgium, Canada, China (Shanghai & Shenzhen), Czech Republic, Denmark, England, Finland, Germany, Greece, Hong Kong, Hungary, Indonesia, Ireland, Italy, Japan, Malaysia, Netherlands, Norway, Philippines, Poland, Portugal, Singapore, South Africa, South Korea, Spain, Sweden, Switzerland, Taiwan, Thailand, Turkey and USA. To understand where we should look to find the hidden gems, we first need to understand the current investment landscape and competition. I’m a firm believer that markets are fairly efficient. One should respect the huge amount of clever highly educated people spending all their efforts trying to find the best investment cases, all with the goal to outperform markets. Lately a lot of money has gone into passive investments but there is still a lot of money sitting with fundamental active managers. Not only passive investments drive return today, we also need to compete with machines. In the last 10-15 years the competition from computer algorithms have increased significantly. In the beginning it was only hedge funds, like AQR, Renaissance Capital and a few other that were using statistical analysis to find stocks characteristics that on average outperformed the market. They applied much of their strategies in a market neutral or at least hedge manner. Meaning going long the stocks they thought had the right characteristics and short the ones that had the opposite. Today this market has exploded, Smart Beta, Factor/Style investing has gone mainstream and huge amounts of money is invested in it. Also fundamental fund managers use these screens to come up with stock picking ideas and evaluate their fundamental portfolios from a factor/style perspective. When I started this blog my ambition has always been to apply similar screens, but on parts of stock universe which institutional investors can not reach. On top of that, with internet, cheaper brokerage fees and everyone having all the information in the world at their fingertips, private individuals have entered the space of stock picking in a way never seen before. Just look at the amount investment blogs out there, with young and old trying to dig up new investment cases. Professional investors, most of the money sitting with long only mutual funds, but also hedge funds and family offices has large pools of money to deploy. Through company visits, and deep analysis they find the miss-priced stocks according to a multitude of investment styles and approaches. 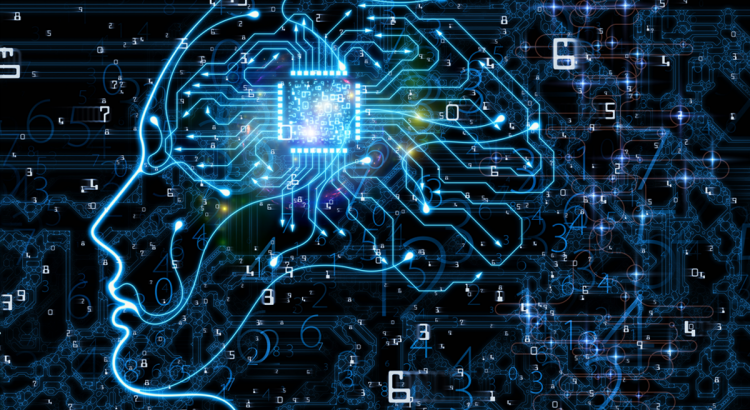 Smart Beta / Factor / Risk Premia / Statistical Investing, it has many names, but all of them is based on the idea of sifting through large amounts data, finding patterns in that data that indicates as high probability as possible of out-performance. The styles here are also developing, but having worked in this field, the strategies tend to be more similar. The sophistication is rather related to the type of Quant strategy, the simplest being large smart beta ETFs and Funds and the most sophisticated are still firms like AQR and Renaissance Capital. Individual investors – everything from total beginners, to very professional individuals, investing mostly their own money. Here many have no idea of what they are doing, but there is also wisdom in crowds and on average they might be right, that’s all that matters. There is also a large group of clever hobby investors or finance professionals who invest their own money. My main thesis is to look where few are looking. Do not look for stocks in the same pool as where one or all three above listed categories of investors are looking. The probability to find something “unique” is pretty low, but at least concentrate your efforts where the above three categories is looking less. Sabre Capital (John Huber) wrote an excellent piece on this, well worth a read: What is your investing edge?. As is argued, many investors believe that if you just look for small caps you have an edge. You have then solved the problem of competing with the “big fish” in category 1-2 above. That is probably true, but one then forgets the “small fish” in category 1-2, as well as the whole category 3. Meaning just buying small-caps is simplifying it a bit too much. Actually as we all know many private individuals love investing in small caps, penny stocks etc. This is appealing to anyone with some gambling genes in them, the thrill of fast gains is exciting even for the most professional investor. Just like the option market has a volatility smile, meaning investors are willing to pay more for call options with a high return potential. I believe small and micro caps in bull markets could actually on average be overvalued, due to this effect, people love buying a lottery ticket. Again, in bull markets this might be an area to avoid. Professional investors come in all shapes and sizes, but to manage money in today’s world comes with certain levels of costs. If your AUM (Assets Under Management) is too small, those costs become unreasonably large compared to your potential income. Without doing a big deep-dive into this, this is my thinking in a few sentences. I would argue that firms with less than 200-300 million USD in a fund, does not really bear itself long-term. There is definitely a lot of funds smaller than that. But they either do not have the resources to actually do all that research that we are afraid of competing with, or they belong to a larger fund group, where they have some small funds but total AUM is higher. Such a firm usually will focus its research on larger companies, for its larger funds. What are the smallest companies these funds can then reasonably invest in? Again we want to avoid the stock pickers, small funds that run a 200 stock portfolio, would not worry me. The amount of research spent per company, by a small fund with 200 holdings, will be more like an index fund than actually doing deep research. Let’s say 30 holdings for a small stock picking fund of 250 million AUM. That gives us 8.3 million USD invested per holding. What would such a fund managers requirement on liquidity be for buying position in the 8 million range? Well I don’t think they would be comfortable holding anything more than 10 daily turnovers. Actually if the fund is registered under UCITS or such, this would not be allowed for a daily traded fund, but some funds are not daily, like hedge funds. So let’s stick with the generous assumption to begin with. This means that stocks with daily turnover below about 800 000 USD would be a no-go. If we look at Quant funds, I would say their requirements on liquidity is much much higher. Having worked on building such quant strategies, in a long/short context, for Europe we would not go outside the Stoxx 600 companies, so anything below that, would be under the radar for our factor strategies. Some other funds do go lower, but not much much lower, meaning there is still a huge chunk of the market where factor strategies is not applied. Again this something we then instead could explore to copy their ideas, but in a stock universe they can not touch. The source of this data is 3 different studies: “Participation Matters: Stock Market Participation and the Valuation of National Equity Markets – Journal of Financial and Quantitative Analysis”, “Stock market participation and household characteristics in Europe” and “The Effect of House Price on Stock Market Participation in China: Evidence from the CHFS Micro-Data – Emerging Markets Finance and Trade”. For the few markets that has data both from 2000 and 2007, one can see stock participation in most developed economies has increased significantly (Sweden, Denmark) over the year. In general if we would have data for 2018, participation it probably higher in most markets. Better data would be great, but if the pattern stays the same the above is still useful. 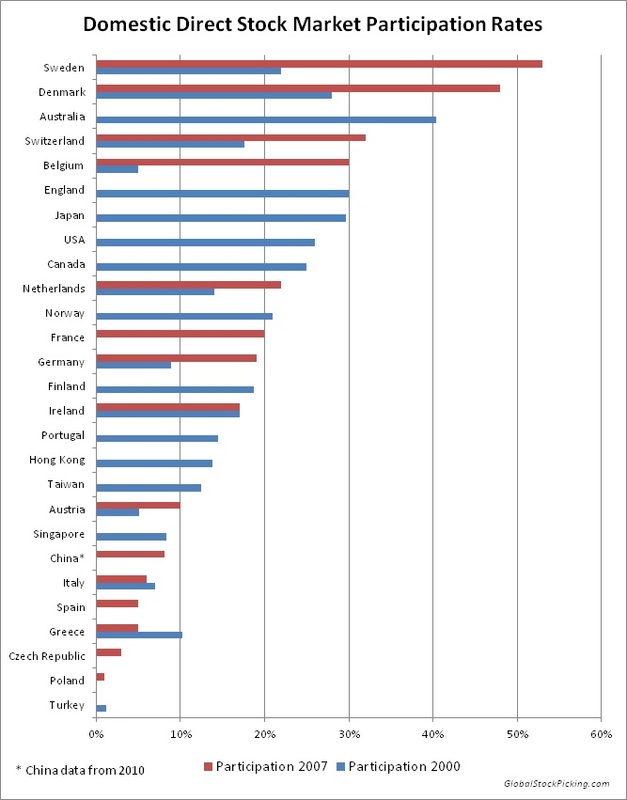 We can definitely conclude that less people are participating as direct owners of companies in Italy, compared to Sweden. My thesis here is that on average one would have more success looking at smaller companies in Italy, than in Sweden. How many companies are we then left with? Now let’s also define a liquidity filter. Unfortunately my screening does not support a turnover screening, instead I have translated it into a rough estimate in terms of MCAP. After some sample checks a Market Cap below 500 MUSD combined with a free float above 30%, is more or less in line with a daily turnover under 800 000 USD. Another filter I throw in putting floor on MCAP at 15 MUSD. I’m not interested in investing in too small companies. 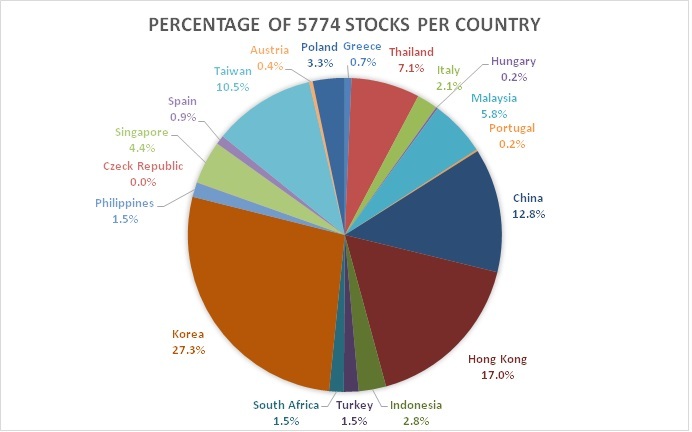 So if these 5774 stocks is our new hunting grounds, what do we do next? It is still too many stocks to read up on, now its time to apply different metrics. These metrics should be something you believe in that your companies should have to be great investments. One such metric is the Piotroski F Score (More about Piotroski). Pick out a universe of stocks where few others are looking. Use a quantitative metric like Piotroski F-Score to within the this universe pick out stocks with good characteristics. The idea of this is that this selection should on average out-perform the market. For this to be true, one has to believe that these are stocks less covered by the market and that Piotroski F-Score actually works as an indicator for alpha generation. If you start a fund investing according to my steps above, basically you then have a Piotroski Quant Fund. This fund is probably picking stocks where no other Quant-funds are looking. I hope such a Quant fund would outperform the market, and we could back-test this model (if I just had the time). But even if it does not, my idea is to apply my own due intelligence on top of this, to pick the best companies from the above 111. So for me it matters if the above 111 stocks generates alpha, but its not the end of the world if they do not. As long as the stocks I pick from the 111, generate alpha. Another way which I played with earlier to find certain investments, has been identifying sub-sectors with future great prospects. For example I believe certain type of beverage and brewery companies have a very attractive business profile. Instead of using countries to define the universe, one could combine sub-sectors with metrics to find the for example few undervalued Beverage companies. This was one example of a screening process. One could endlessly modify how one picks out the first the universe, and then the metrics. A will write more on this topics in a follow-up post, creating especially more metrics. The trick is to figure out what your investment style is, express that in metrics, and the screening will do the rest. Well maybe not the rest, you still need to decide what on the shortlist you want to invest in. Happy to take any input on what you think would be successful screening methods, preferably backed up by some good reasoning! Great article and good job on breaking down the invest able universe. I never thought of participation rates. Also Piotroski > 8 may be too strict >6 should be fine to identify companies with good fundamental momentum. It will also give you a bit larger universe. Thank you Tim, the material on your site looks excellent, I will draw inspiration from that when I find the time to write my Part 2 on Art of Screening! Yes >8 is probably too strict, it was mostly to make an example of a Universe that didn’t become too big. Interesting post. 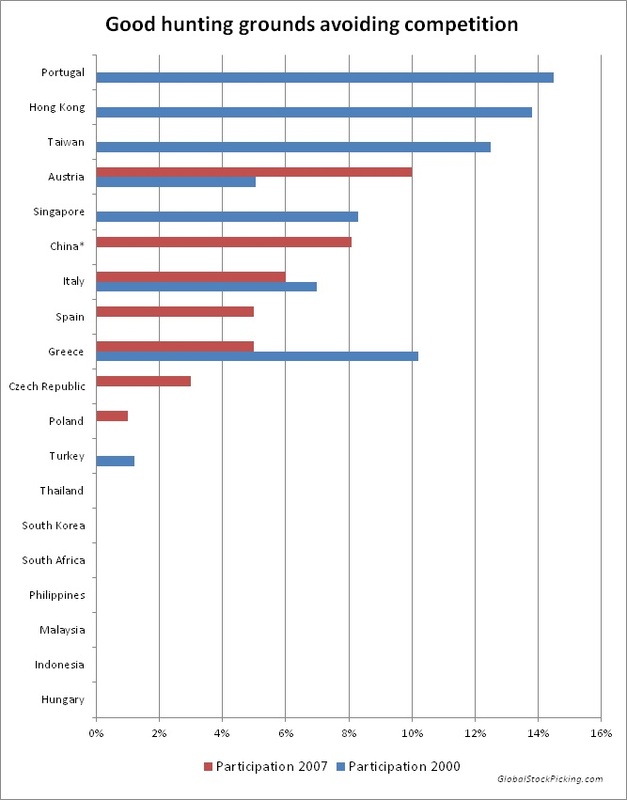 In the screening you end up with a number of EM countries as well as small cap, which both should mean worse corporate governance, liquidity risk, political risk etc. compared to large caps in developed markets. How are you thinking about your return requirement – would you adjust it? And would you also consider to increase the number of holdings in the portfolio? Hi Wilhelm, thats right in general you get exposed to more of these risks. I think this will mostly already be priced in, these stocks will trade at lower multiples for the above mentioned reasons. I definitely have a higher return requirement. The idea of doing my own DD on top of this is of course to try and minimize those risk. But yeah political risk for example is hard to get around. Very good article. Can’t wait for #2. Cheetah Mobile (CMCM US) – Value or a trap? Cheetah Mobile (CMCM US) - Value or a trap? Dream International - a dream investment? This blog is for informational and entertainment purposes only and should not be considered as investment advice of any kind. You should also not consider any information from this blog as a recommendation, or an offer or solicitation for the purchase or sale of any security referenced. All information from sources are believed to be reliable although its accuracy or completeness cannot be guaranteed. All information and opinions are subject to change without notice. Please do your own due diligence before investing.